The Regional Administrative Committee Chair, publishes the meet timeline to OTSM (Online Tariff Sheet Manager) This will includes the meet ref and judges list information from the Regional Judging Coordinator. Meet director publishes due dates in registration packet. 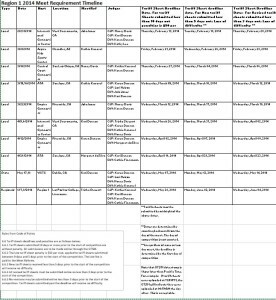 The Meet Requirement Timeline is a spreadsheet located in each regions main folder. 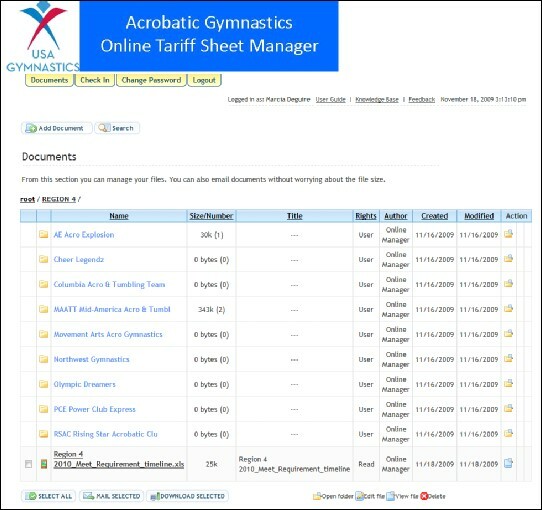 Coach reviews meet requirement timeline for due dates and uploads tariff sheets to Online Tariff Sheet Manager(OTSM) prior to 10 day deadline. When a Coach or Official logs in, their Applicable Region shows. Double Click on Region. The example below shows region 4. Official (judge, Meet director, Regional committee) log in credential allows them to see all clubs in their region. 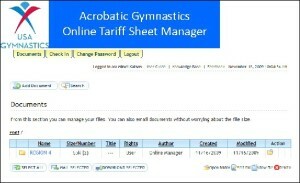 Coaches log in rights, restricts them to seeing their club information only. 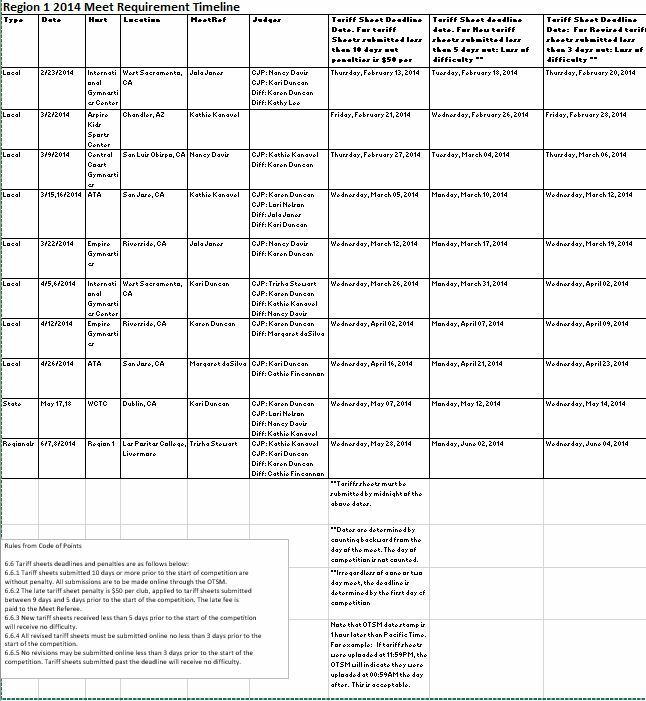 Coaches and Judges use the meet requirements timeline document for meet deadlines, and judge assignments. To add a tariff sheet, coach clicks on the add document link. 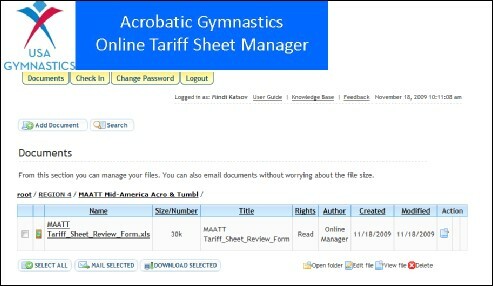 It is recommended to use the name of the meet for the title. Make sure the Never Expired and Expired set boxes are checked. Click on Save. 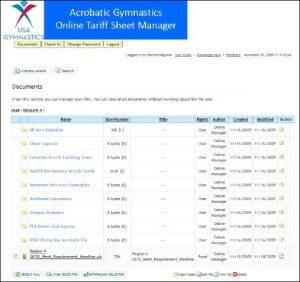 Tariff sheet is now uploaded. 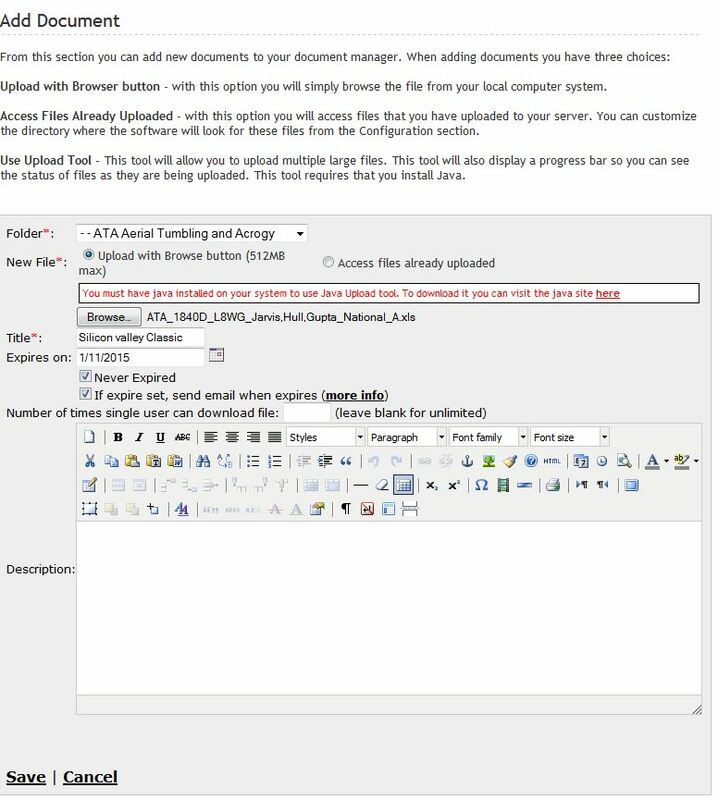 To upload a modified tariff sheet, go through the same process, roll the revision to the next letter and then delete the old version. 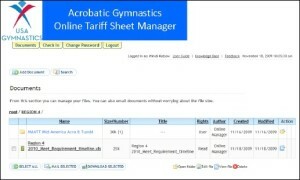 Meet ref, CJP or DJ reviews tariff sheet and emails coach with comments. 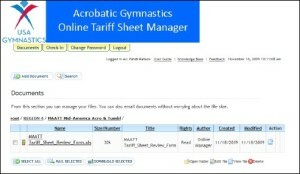 Coach makes changes to tariff sheet. 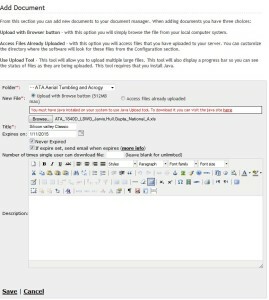 Uploads to site and rolls revision letter to next revision.